Yvonne works with Anything is Pawzible and has been such a guiding light for this newbie pet parent! She humored me by sitting down and answering a few questions on her work, Anything is Pawzible, and what she enjoys most about training. Without further ado: Meet Yvonne! Can you tell us a little about Anything is Pawzible and the services you offer? Rendy Schuchat started the company about 16 years ago and has grown it to 6 trainers in 3 locations around Chicago. We offer group classes from puppy through Advanced, to Tricks, to Canine Good Citizen, to Intro to Agility, and Therapy dog prep. We also do in home or in studio private training sessions for basic obedience or behavioral issues. I started in 2015 and became certified in 2016. Have you always worked with animals? How did you come into dog training? I grew up in a cat household but always gravitated towards dogs. Adopting my first dog as an adult changed my life. I couldn’t believe how quickly they learned, and how little I knew about building a training relationship. It is also how I started volunteering with local rescues and fostering dogs. I read a lot of books and took many group classes. Our trainers back then are still mentors and friends to this day. One of them started an amazing school with classroom discussions, hands on training, and internships of which I am a graduate. It paved the way to becoming the trainer I am today. I also saw how much bad, antiquated information was out there. There are still trainers out there doing horrible things to dogs like inflicting pain and owners who don’t know any better, like rub a puppy’s nose in their waste. I was a researcher at Northwestern for 15 years so going with what the data shows is very important to me. I also felt I needed to be a voice for the dogs and help people help their dogs. What is the process of becoming a trainer like? It’s an unregulated field but that may be changing. That said, anyone can put up a website and say they are a trainer. It is a science-based field full of ethology, anthropology and psychology. I thrive on learning more all of the time. It’s a never-ending process. I go to conferences and lectures as much as I can. I’m always reading. For me, the Academy was 9 months and getting my CPDT-KA (Certified Professional Dog Trainer-Knowledge Assessed) took another year. Sasha, she’s a legend! We adopted her at a year of age from Animal House Shelter in Huntley. She was nervous in the city, chased everything, always had her nose to the ground. But she was always patient with me and showed me she was perfect all along, I just needed to catch up! She’s a boxer foxhound mix. We also have Kyle. He’s one of our many fosters from Chicago Canine Rescue. He was a return and needed an experienced person to work through some of his issues. He loves Agility and is my shadow. He looks like a blonde shepherd. Who knows what he is! Seeing the success people have with their dogs. Every case is different so it is never boring. There is a lot of detective work. I can get a call for a potty training issue and discover it is separation anxiety peeing and the owners had no idea. What’s something people find surprising about dog training? Are there any misconceptions about training you’d like to dispel? That it should be fun. No matter what issue you are having, if you look and sound angry or frustrated, your dog will respond accordingly. I hear “my dog is stubborn” a few times a week. I don’t believe in stubborn dogs; I do believe in unclear communication and lack of proper teaching. Do you have any favorite success stories or breakthrough moments? I had one dog that wouldn’t leave the building. They had to drive him from the parking garage to the park to go to the bathroom three times a day. They didn’t know he was anxious in the home. After several weeks of building his confidence and understanding their dog, he now walks out the front door, tail wagging. What inspires your work and what sets you apart from everyone else? 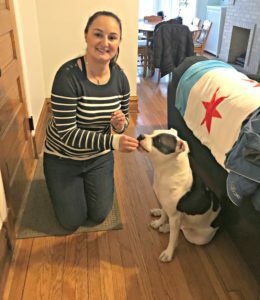 The Chicago rescue community inspires me. There is a lot of camaraderie and I do believe it takes a village to help our homeless pets. Many pets are relinquished because of behavioral issues. My goal is to keep pets with the people who love them from the start or help that dog get a second chance with someone with the tools and patience. BONUS QUESTION! What’s your go-to karaoke song? There ya have it folks! Yvonne is awesome. She’s given me tools to better understand Gretchen’s behavior and advice on how to best direct Ms. Gretcho to success. It’s not only improved the way Gretchen and I navigate the world, it’s strengthened our bond, as well. I couldn’t recommend Yvonne and Anything is Pawzible enough!